The automotive industry has seen the biggest users of automated robotic systems in the manufacturing sector. Large robotic arms with high payload capabilities and long reach move freely to spot weld car body panels, install windshields or mount wheels, while smaller robots are used to weld and mount subassemblies like brackets. All these are typical operations in international automotive factories. Though many have worried that automatic production is taking away employment, these robots have protected workers from hazardous fumes, hot moldings and other dangerous conditions, and have eliminated human error resulting from tedious operations and negligence caused by tiredness at the end-of-shifts. The ever-increasing manufacturing speed and precision brought by advancements of robotic technology have given automakers an important competitive edge in producing premier quality automotives. Safety, quality, and capability are the main reasons for adopting robotic technology. The management of automated manufacturing on the production lines is a complex operation, considering that thousands of parts are needed to make up a car, and thousands of cars have to be produced per day in the plant. Not to mention that the manufacturers change new car models every few years to keep up with the demand of car buyers, and different models mean different materials, so different tooling and different processes need to be implemented. A production planning system with precise computer-controlled processes was necessary to implement high quality, high throughput, flexible production, and seamlessly integrated processes. In this case study, the compact-sized high performance Advantech ARK-2250 fanless embedded computer was used in a state-of-the-art automated assembly facility of an international automotive producer. ARK-2250 was implemented into a networked process control manufacturing system that provides detailed information about parts that need to be installed and records production details for product quality control. In addition to process control and information display, this project also had demands for data acquisition, edge intelligence, and remote monitoring control functions. For example, when the controller detects a potential problem based on the data it collects from sensors and actuators, it will automatically close down the process, issue alerts and alarms and send messages to remote computers, smartphones or other mobile devices used by management. So, the PC controller used in this case has to be equipped with suitable computing and data storage capabilities, and a software platform was needed for integrating IoT functions. In addition, as the computer will be mounted on the arm of a monitor providing task information at each workstation for operators to view, the system needed to offer appropriate display outputs. The power, LAN, and all the wires and cables have to be securely connected to ensure operational reliability and stability. Industrial-grade ruggedness in terms of wide voltage and temperature range support was also needed for operation in the harsh manufacturing environment of a car production plant. At each workstation of the assembly facility, the Advantech ARK-2250, with appropriate power, LAN and HDMI interfaces, was mounted onto robotic monitor arms and connected to power, network, monitoring sensors, and actuators with lockable wires and cables; lest any wire or cable should fall off and cause operational failure or interruption. 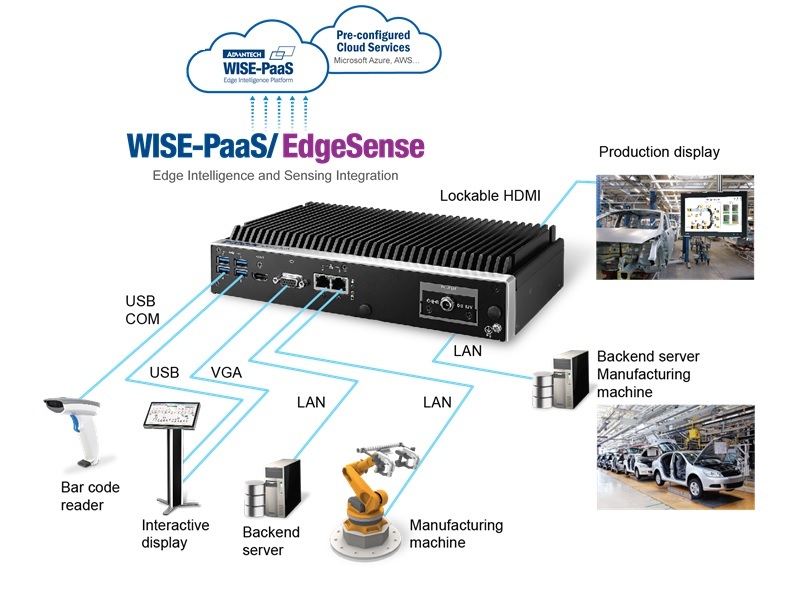 To enable data acquisition, data display and remote monitoring control functions, the ARK-2250, as well as the backend server, are deployed with Advantech’s IoT WISE-PaaS/RMM software platform. With the hardware and software provided by Advantech, the system will be used to provide information about the next item that needs to be installed in the assembly process, and display the information on the mounted monitor for onsite operators to view. Meanwhile, it will also collect and export data to an SQL Server database to archive production records and aggregate big data for future process improvement and system maintenance. The ARK-2250 controller will also stop the process immediately when it discovers any problems based on data collected from the safety sensors, so as to avoid damage and reduce financial loss. For display options, ARK-2250 provided HDMI, VGA, and optional 3rd party display interfaces, providing flexibility for different application scenarios. Equipped with a state-of-the art Intel 6th Gen Intel® Core™ U-series (i3/i5/i7) processor, the ARK-2250 delivers high computing performance in a 260 x 54 x 140.2 mm (10.24" x 2.13" x 5.52") compact sized mechanical design to integrate nicely with the high speed automated automotive production lines. Supporting a unique ARK-plus expansion module and i-Door I/O modules, the ARK system can be easily expanded to enrich storage and industrial interfaces on an optional basis. Industrial users like automotive makers, when retrofitting their production lines to produce new models, can rely on ARK computers which can be flexibly adjusted or upgraded for reconfiguration to meet design changes with minimum extra capital investment. 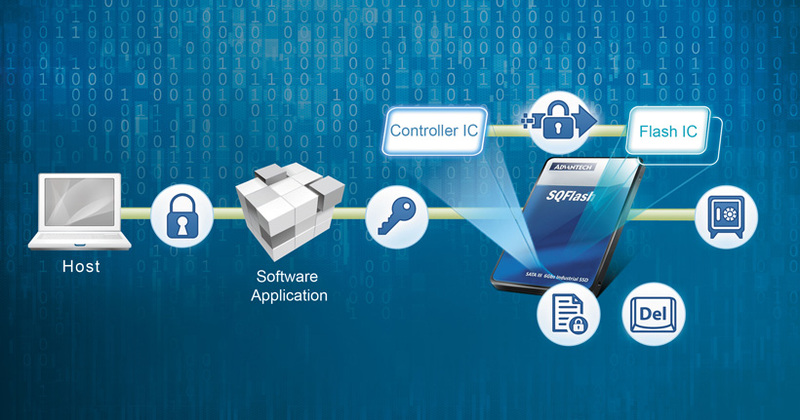 In terms of software support, Advantech ARK computers are all deployed with the Advantech WISE-PaaS software platform, which aggregates and integrates the software resources needed for customers to develop their own industrial control, IoT, or cloud applications. 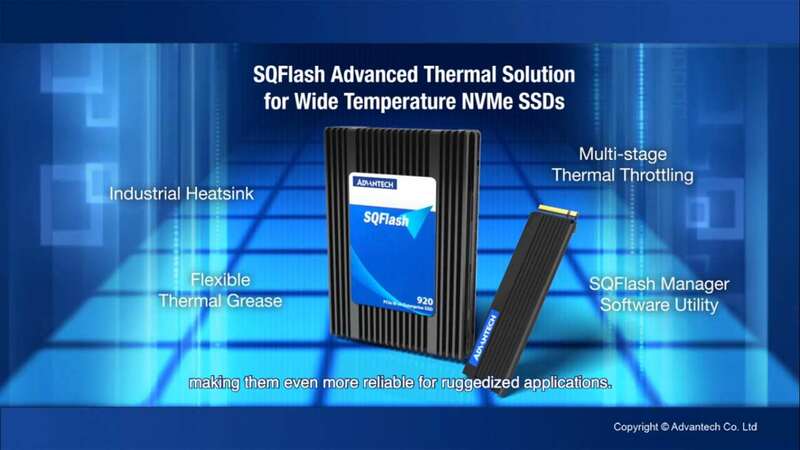 Advantech’s WISE-PaaS/RMM software was used to develop remote monitoring control and IoT applications. It provided a very easy-to-use dashboard builder that allowed the system integrator to develop their own cross-platform and cross-device dashboard. Now the factory managers can view data and quickly understand the status of their production lines via any browser-based computer, smartphone, or other mobile device from anywhere at any time.